The International Tribunal for Rwanda (ICTR) is now closing down after nearly 20 years of business, and continues to be subject to unprecedented criticisms. Since its establishment in 1994, it has consistently failed to recognize genocide victims’ right to participate in the proceedings and has yet to establish a fund to provide reparations to victims. These criticisms have been coupled with the acquittals of the most notable masterminds of genocide, including the head of death squad, Protais Zigiranyirazo also known as ‘’Mr. Z’’and most recently the former Ministers of the genocidal interim government Justin Mugenzi and Prosper Mugiraneza. In contrast to the ICTR, the International Criminal Court (ICC) established in July 2002, explicitely recognizes the rights of victims to reparation, provided through its Trust Fund for Victims (TFV). Following the establishment of the ICC, which only is competent for crimes committed after July 2002, on 8 February 2013, an Extraordinary African Chambers (EAC) has been officially inaugurated within the Senegalese judicial system to prosecute “the person or persons most responsible” for international crimes committed in Chad between June 7 1982, and December 1 1990. The former president of Chad, Hissene Habre, will be the first person to be tried by the EAC. The Extraordinary African Chambers marks another milestone development in international criminal law. Similar to the Rome Statute of the ICC, the Statute of the EAC provides for the participation of victims in the proceedings as civil parties and for the award of reparations. This article analyses these provisions and concludes by calling for the ICTR to take a lesson from this best practice in the short time remaining before its official closure in December 2014. In the proceedings before the ICTR, victims are neither allowed to participate in their personal capacity nor are they entitled to receive compensation or reparation for damages suffered. The primary concern of the drafters of the Statute and Rules of Procedure and Evidence (RoPE) of the ICTR was the punishment of those guilty of serious violations of international humanitarian law. The right of victims to participate and to obtain compensation was dismissed and excluded from the proceedings. Neither the Statute of the ICTR nor the RoPE afford them any personal right to intervene in the case so that they may ensure the protection of their interests. The Extraordinary African Chambers statutes are largely inspired by statutes of the ICTR and the International Tribunal for the former Yugoslavia (ICTY). Like the ICTR, the Chamber’s statute gives full competence to try crimes of genocide, crimes against humanity, war crimes and torture as defined in the statute. However, unlike the ICTR, victims will be able to participate in the proceedings before the Extraordinary African Chambers. Furthermore, the statute of the Chambers establishes a victims’ fund which will implement reparations ordered by the Chambers, and funded by voluntary contributions by states, international institutions, NGOs and private donors. Reparations from the victims’ fund are also available to victims who do not participate in the Habré trial. 1. The reparations granted by the Extraordinary African Chambers are restitution, compensation and rehabilitation. 2. The extraordinary African Chambers may decide that the award for reparations be made through the fund referred to in Article 28 of this Statute. 3. Before making a decision under this section, the extraordinary African Chambers may seek comments of the convicted person, victims, and other persons or interested States. 4. The provisions of this Article shall apply without prejudice to domestic law or international law recognizes the victims. 1. A fund is created for the benefit of victims of crimes within the jurisdiction of the Extraordinary African chambers and their lawful successors. This fund is financed by voluntary contributions from foreign governments, international institutions, non-governmental organizations and other sources willing to provide support to victims. 2. Reparations can be attributed to the victims individually or collectively, whether or not they participated in the proceedings before Extraordinary African Chambers. The deliberate failure to enable victims to participate in ICTR cases has been a serious hindrance to the Tribunal’s impact and survivors’ perception and trust in the international justice rendered by the ICTR. Rather, it should be recognized that both Rwanda and the international community have a moral and legal obligation to protect and enforce the rights of victims. It is unfortunate that ICTR statutes intentionally omitted any of the provisions above. For the drafters of the ICTR Statute, the priority has been to uphold and champion the rights of the accused, allowing those guilty of the most heinous crimes to be treated luxuriously in the auspices of the Tribunal at the expense of victims. The establishment of the Extraordinary African Chambers is yet another reminder for the Mechanism for the International Criminal Tribunal (MICT), to request the UN Security Council set up a reparation programme for genocide victims before it is too late. 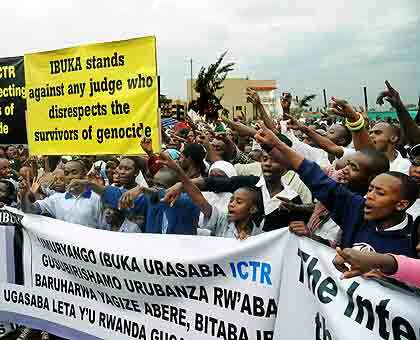 Through the eighteen years since the ICTR was established, at a cost of nearly $2 billion USD (the equivalent of almost $30 million USD per suspect convicted), genocide survivors in Rwanda have felt disregarded and mistreated by the legacy of this ad hoc Tribunal. As the ICTR prepares to close down next year, it is recommended that the best practice model set by the Extraordinary African Chambers be recognized and implemented. It is not too late to make the voices of victims heard in law, and to establish true and fair justice system for the trying of international criminals in Rwanda.